Lead is ubiquitous in nature. It affects virtually every system in the body. It can damage the nervous system, the renal, and the reproductive systems, cause high blood pressure, and affect growth and development, psychological behavior, and intelligence. Lead exposure in young children is of particular concern because children absorb lead more readily than adults and the developing nervous system of children is particularly vulnerable to the adverse effects of lead. Blood lead levels (Pb-B) as low as 10 μg/dl (microgram/deciliter) are associated with harmful effects on the children's learning and behavior. Elevated BLL can result in learning disabilities, behavioral problems, and mental retardation. Lead dust released in the environment during mining and smelting of lead can cause lead exposure to the population living in the vicinity of the mine. Such an open cast mine is situated in Rajasthan State. Hence, a study was undertaken to obtain the base line lead exposure data and its likely health effects on children residing in villages near the mine. A total of 452 (exposed - 298 and comparative group - 154) school children in the age group of 9-14 years were randomly selected from different villages. The exposed group comprised of the children staying within a 2.5 km radius of the mine and the comparative group included children from villages situated at least 10 km away from the mine. The study covered medical examination along with lead estimation in the blood sample of each subject. Details of personal and general information along with specific medical examination related to lead toxicity/poisoning were recorded in the pre-designed and tested medical proforma. BLL was used as a biomarker of lead exposure in the study. Three milliliters of venous blood was collected taking due precaution in a heparinized vacuette at the school premises for lead estimation. The collected blood vacuettes were stored at -4ºC in the deep freezer and were transported to the laboratory in dry ice packs. Two milliliters of whole blood was digested in a wet digestion system (Ethios 1600, advanced Microwave lab station made in Italy) using a mixture of 2 ml of nitric acid (ultra pure) and 0.2 ml of hydrogen peroxide while maintaining the time and temperature. The final volume was made to 5 ml using triple distilled water and centrifuged. The clear solution was injected in the atomic absorption spectrophotometer (AAS) to estimate the lead levels in the bloods. Quality control samples of lead in the blood of different required concentrations were obtained from the Center for Disease Control (CDC), Atlanta, USA. These samples were also run along with the actual analysis of samples to assure the validity of the results. To assess the environmental exposure levels of lead, representative ambient air and drinking water samples were also collected using standard methods from the villages falling within 2.5 km radius of mine and comparative group of villages which were at least 10 km away from mine and their analysis for lead was also carried out using AAS. This will be the first systematic study to know the lead exposure in children residing near the lead producing open cast mine in India. Environmental monitoring (air and water samples) was carried out of the same villages from where the study subjects were selected. The lead levels in water samples ranged from 6.3 to 13.3 μg/L in different villages situated near the mine, which was less than the prescribed level of 50 μg/L (Central Pollution Control Board [CPCB], 2006). The values of lead in ambient air vary from 0.026 to 1.04 μg/m 3 , which were within the prescribed levels of 1.5μg/m 3 (CPCB, 2006). These data indicate a lower level of lead exposure due to the mine. BLL is an indicator of current exposure and it reflects a dynamic equilibrium between absorption, distribution, and elimination of lead. BLLs in children were used to know the current level of lead exposure. [Figure 1] presents the mean BLLs of children residing in villages near the mine. It indicates that the mean BLL in exposed children was 7.7 μg/dl for boys and 8.56 μg/dl for girls while in the comparative group the mean BLLs in boys was 6.12 μg/dl and 4.63 μg/dl in girls. Mean BLLs for the exposed group of children were less than 10 μg/dl, which was considered as a normal value for children as per the CDC,  USA. About 80% of the lead values were observed to be less than 10 μg/dl. [Table 1] gives the personal characteristics of the study subjects recorded during the medical examination. This table shows that the exposed group consists of 159 boys and 139 girls of areas located within a 2.5 km radial distance from the mine, whereas 78 boys and 76 girls from areas located at least 10 km away from the mine constitute the comparative group. It clearly demonstrates that both the groups were comparable on various parameters like age, smoking history, tobacco chewing habit, and socioeconomic status. Only three boys from the comparable group (3.8%) and two boys from the exposed group (1.3%) gave history of smoking. 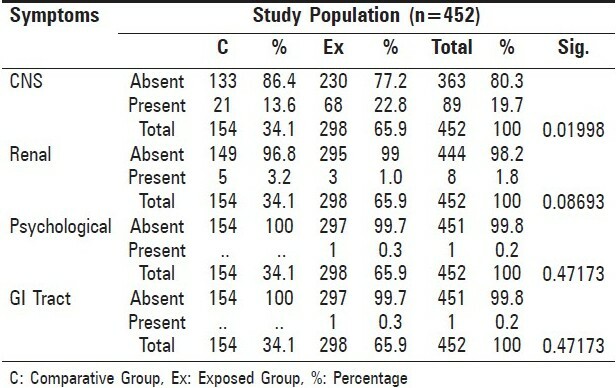 [Table 2] presents the prevalence of symptoms in the subjects studied. Gastrointestinal tract, psychological and renal system related symptoms were present respectively in one (0.3%), one (0.3%) and three (1%) of study children from the exposed group but these prevalence were not significant with respect to comparative group. Maximum BLL found in the exposed group was only 14.4 μg/dl. At this BLLs, clinical signs of lead toxicity are not reported, although self-reported central nervous system (CNS)-related symptoms were observed in 22.8% of the exposed children and 13.6% of the comparative subjects, which is statistically significant (P < 0.05). Medical examination did not reveal any signs of lead encephalopathy or peripheral neuropathy. [Table 3] and [Table 4] present the anthropometrics measurements of boys and girls selected in the study. Large cross-sectional studies of young children have shown the association of increased lead concentration with decrease in height, weight, or both. , The age group-wise evaluation of the somatic growth of the study subjects shows that in both exposed and comparative groups, growth parameters like height and weight were in an increasing trend of values with increasing age, which can be explained as a normal trend. 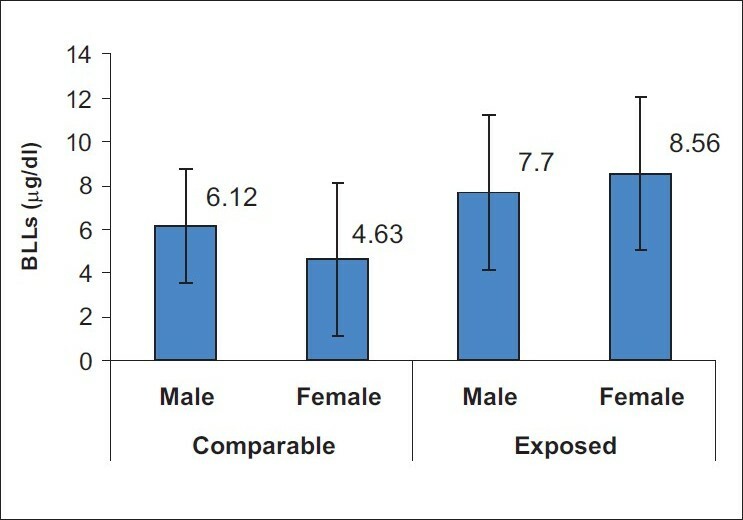 Physical growth parameters of the exposed group were comparable with that of the control group for both girls and boys. The physical growth was not affected at the observed level of lead exposure. The results of the present study represent preliminary efforts in generating a database of information on lead exposure to children residing near the mine and also to make an attempt to find out the extent and magnitude of health risk consequent to such exposure, considering the different parameters studied. The main positive finding seen was the CNS-related symptoms as reported by the subjects during the medical examination, which was found to be higher in the exposed group compared with the comparative groups. The difference in both groups was observed to be statistically significant; however, symptoms like headache and giddiness were non-specific in nature and cannot be attributed to only lead exposure. The present BLLs observed in the exposed group of children were not that high, which can give rise to classical signs and symptoms of lead toxicity, like lead line on gums, abdominal pain (lead colic), neurological deficit, joint pain, severe vomiting, anemia, etc. in children. It is reported that the effects of lead on the CNS are embedded in a complex process involving biologic, environmental, familial, and socioeconomic factors. Epidemiological studies cannot, by themselves, establish a causal relationship. Causality is not subject to empirical proof, whether in field or in the laboratory. In India, lead levels and its health effect in children residing in rural areas are not studied much; hence, it is difficult to compare these data with other such data. Bellinger et al. reported BLLs 11.1 ΅g/dl with the range of 2.5-38.3 μg/dl in a cross-sectional study of 74 (4-14 years) children residing in Chennai. Jain and Hu  found BLLs between 5 and 20 μg/dl in a retrospective cross-sectional analysis of data from the Indian National Family Health Survey, a population-based study conducted in 1998-1999 in 1081 children (below 3 years) in Mumbai and Delhi. Ahamed et al. also reported a mean BLL of 7.47 μg/dl, with the range 2.78-15.0 μg/dl in 62 children (4-12 of age) in Lucknow and nearby areas. Our data are more or less comparable with these data, which were mainly collected from urban cities of India. Low levels of lead for a longer duration in these children may lead to health risk in the future. Hence, preventive measures and intervention strategies are required to control low-level lead exposure in order to safeguard the children. Engineering control at the source of the dust exposure should be made powerful so that emission levels of lead dust will remain controlled. Periodic medical examination, including biological monitoring of the children residing near the mine should be carried out. Periodic assessment of community environment (like air, water and soil) near the mine should be carried out. Health education and awareness programs related to lead exposure and health effects should be organized for the villagers residing near the mine. To safeguard the children from health risk due to lead exposure, the mine management was requested to follow the above suggestions/recommendations and create/maintain the environment (community as well as work environment) clean and safe in the mine. This will help in sustaining the clean environment inside and outside the mining areas. 1. Moderator: Reigurt R; Panel: Needleman H, Nag D, Maiya PP, Chatterjee R, Parikh DJ. 'Health effects of lead on children and adults' Proceedings of the international conference on lead poisoning prevention and treatment. Banglore, India: 1999. p. 65-72. 2. Central Pollution Control Board (CPCB), AAQS [S.O. 384(E), air (Prevention and Control of Pollution) Act, 1981, date [EPA Notification: GSR 176 ((E), April 02, 1996] 2006. 3. Centers for Disease Control, Preventing Lead Poisoning in Young Children: A Statement by the Centers for Disease Control, Report No. 99- 2230, Atlanta, GA: CDC, U.S. Department of Health and Human Services; 1991. 4. Frisancho AR, Rayan AS. Decreased stature associated with moderate blood lead concentrations in Mexican-American children. Am J Clin Nutr 1991;54:516-9. 5. Ballew C, Khan IK, Kaufmann R, Mokdad A, Miller DT, Gunter EW. Blood Lead concentration and childrens anthropometric dimensions in the Third National Health and Nutrition Examination Survey( NHANES 111), 1988-1994. J Pediatr 1999;134:623-30. 6. Kenny DA. Correlation and Causality. New York, NY: John Wiley and Sons Inc; 1979. 7. Bellinger DC, Hu H, Kalaniti K, Thomas N, Rajan P, Sambandam S, et al. A pilot study of blood lead levels and neurobehavioral function in children living in Chennai, India. Int J Occup Environ Health 2005;11:138-43. 8. Jain NB, Hu H. Childhood correlates of blood lead levels in Mumbai and Delhi. Environ Health Perspect 2006;114:466-70. 9. Ahamed M, Verma S, Kumar A, Siddiqui MK. Environmental exposure to lead and its correlation with biochemical indices in children. Sci Total Environ 2005;346:48-55. 10. Rutter M. Raised lead levels and impaired cognitive/behavioral functioning a review of the evidence. Dev Med Child Naurol 1980;42:1-26. 11. Bornschein R, Person D, Reiter L. Behavioral effects of moderate lead exposure in children and animal models. CRC Grit Rev 1980;8:43-99. 12. Needleman HL, Bellinger D. The developmental consequences of childhood exposure to lead: Recent studies and methodological issues. In: Lahey BE, editors. Advances in Clinical Child Psychology. Vol 7. New York: Plenum Publishing Corp; 1984. p. 195-220. 13. Pocock SJ, Ashby D. Environmental lead and children's intelligence: A review of recent epidemiological studies. Statistician 1985;35:31-44. 14. Needlman H. Impact of lead on behavior and learning in children lead poisoning prevention and treatment: Implementing a national program in developing countries, Proceedings of the international Conference on Lead Poisoning Prevention and Treatment. Bangalore, India: 1999. p. 27-40. 15. Needleman H. Lead Poisoning. Annu Rev Med 2004;55:209-22. 16. Nevin R. Understanding international crime trends: the legacy of preschool lead exposure, Environ Res 2007;104:315-36.